British Empire passports are always on high demand but often at low supply. So it is with this Government of Bermuda passport. 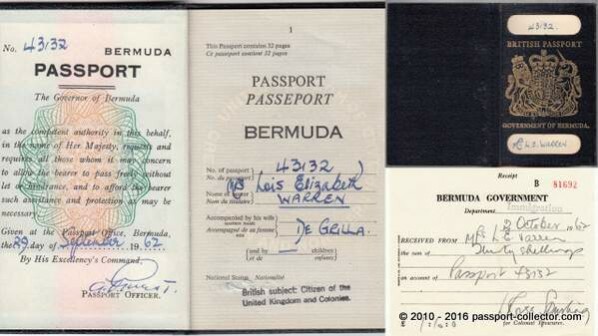 A pretty rare collectible in fantastic condition, issued 1962 at the passport office in Bermuda and valid till 1967.The cool thing is it comes even with the original passport fee invoice. Such invoices are rarely kept by it’s bearers hence they are rare to see but telling us more about the processing of passports in those days. A fantastic collectible with is in one of the finest British passport collections I know. The islands became a British colony following the 1707 unification of the parliaments of Scotland and England, which created the Kingdom of Great Britain. After 1949, when Newfoundland became part of Canada, Bermuda was automatically ranked as the oldest remaining British Overseas Territory. Since the return of Hong Kong to China in 1997, it is the most populous Territory. Its first capital, St. George’s, was established in 1612 and is the oldest continuously inhabited English town in the New World. Historic fact: Ernest Trimingham (1880-1942) was an actor from the colony of Bermuda. He was one of the first black actors in British cinema. Trimingham is a common, but exclusively white, surname in Bermuda connected with an affluent merchant family, and it is likely that Ernest adopted it when he became an actor. He was born in Bermuda in 1880, and died in England on 2 February 1942.